After a season of debauchery with the inevitable over-eating of heavy Christmas dishes we needed something fresh and green to start the New Year. 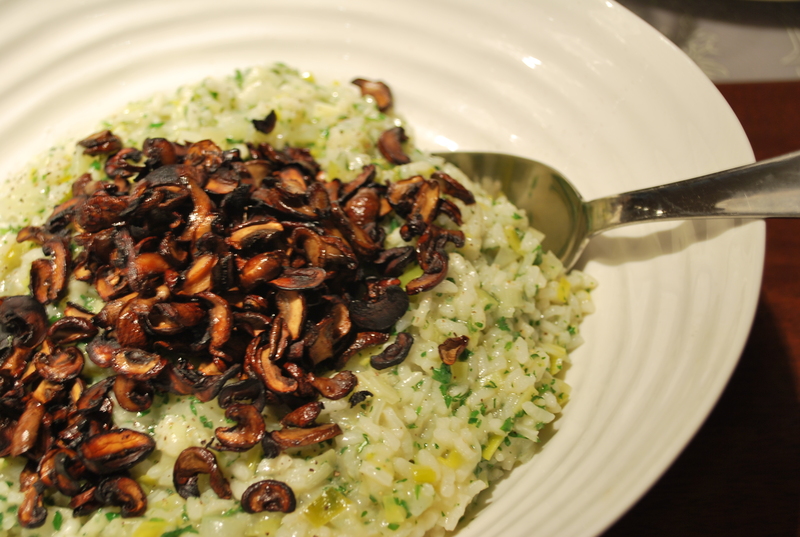 Now most of you will probably not think of risotto as a nice, light, cleansing dish but this one comes pretty close. It’s bright, refreshing, and alive, and without the cheese and butter – which I’ve come to conclude is yummy but totally unnecessary – it is surprisingly light. This risotto won my heart. Heat the olive oil for the risotto in a heavy-bottomed dutch oven. Saute onion, fennel, and leek until tender. Add the minced garlic and saute another minute or two until the garlic is fragrant. Add arborio rice stirring constantly until evenly coated. Begin to add the stock and wine slowly. Remember, the key to good risotto is to 1) stir constantly and 2) add the liquid slowly until the rice is just covered. Let the rice absorb the liquid and then add a little more, again, until the rice is just covered. Repeat. Repeat. Repeat. 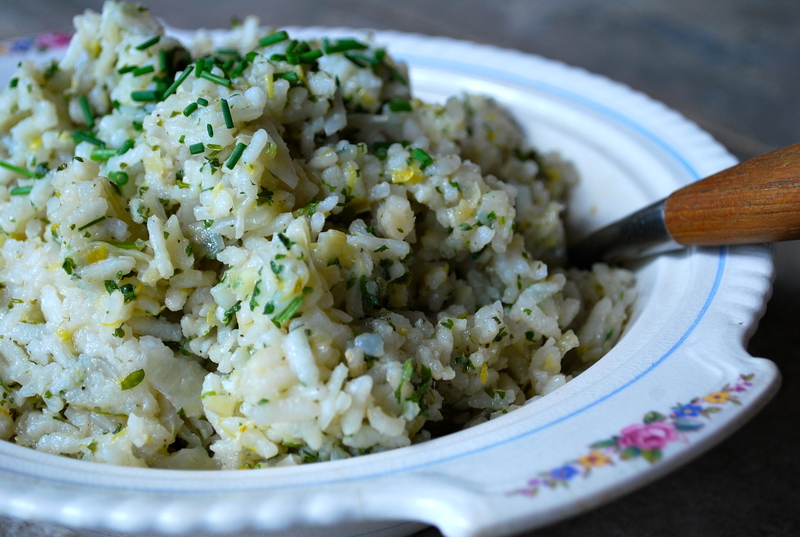 Once the rice has reached the perfect state of al dente-ness add the parsley and the juice of half a lemon and toss. Season with good sea salt and pepper to taste. Transfer to a serving bowl and serve. And have a little bowl of grated parmigiano on the table for those that want to indulge. And enjoy! I was loving all the Thanksgiving recipes coming out of the states this past week. 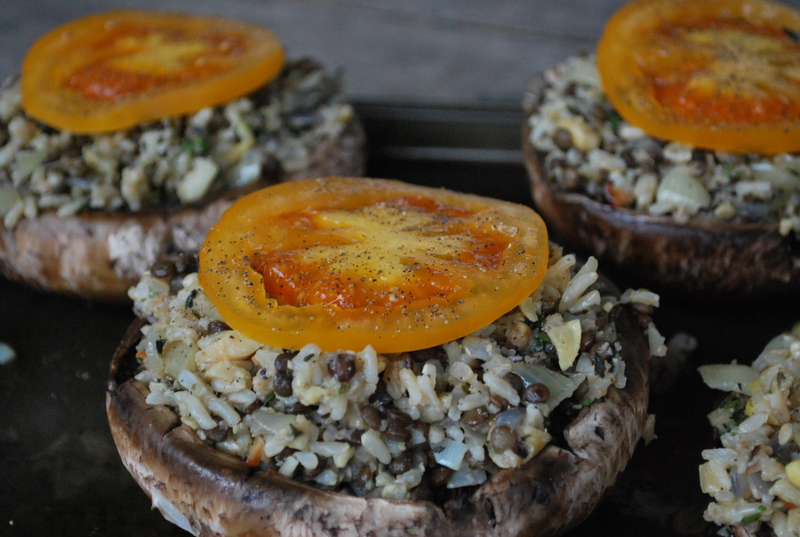 One that caught my eye was stuffed Portobello mushrooms. Last Christmas Lucy Waverman did portobello mushrooms with chestnut stuffing and I had wanted to try it but, let’s be honest, who ever has chestnuts around? So when I saw this one, it satisfied my desire to try stuffed portobellos with ingredients that happen to be in my pantry. I was told it would hold its own at the table and that it did! It may well show up on the Christmas menu this year. 2. In large skillet, sauté the onions and cashews with 2 tablespoons olive oil over medium high heat. Season with salt and pepper to taste, and sauté until onions are soft and lightly browned. Add garlic and let cook a few more minutes. 5. Bake for approximately 30 minutes, or until the stuffing is browned and the mushroom begins releasing juices. Garnish with extra fresh thyme leaves. 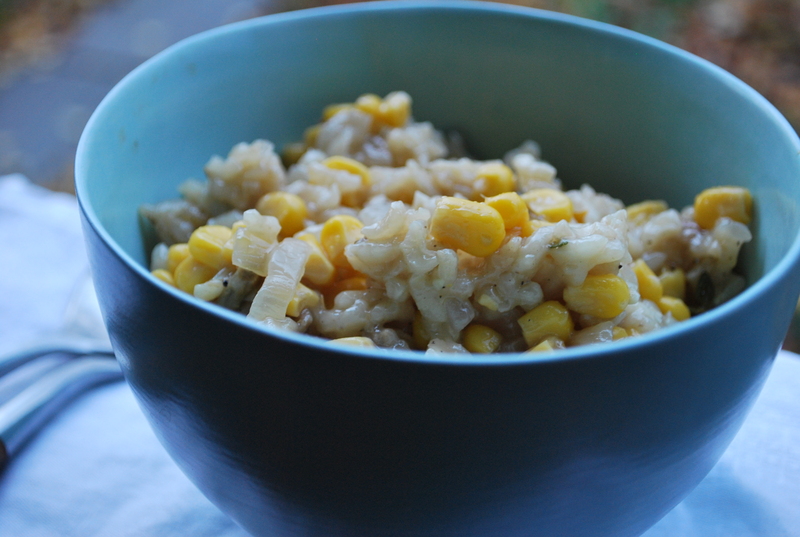 This just in – and apologies to dairy farmers and the fine cheesemakers of Parma – I’ve veganized my favourite Risotto recipe and it’s just as good without the butter and parmigiano. Italian sacrilege, I’m sure, but true. Not only did the original recipe call for butter and parmigiano, but pancetta as well! No matter. It’s just as good without all of that in its pure, unadulterated, vegan form. Eat it and weep folks. Heat olive oil in a large, heavy-bottomed pot. Add onion and garlic and saute until fragrant. Add arborio rice and stir until well coated, about 3 minutes. Meanwhile, boil white wine with dried porcini mushrooms to rehydrate mushrooms. Remove mushrooms, chop, and add to rice mixture. Add stock slowly, just covering rice, and stir continuously. Continue to slowly add stock and wine and continue to stir. Risotto is all about the spoon – slowly add and stir, keep sitrring, keep adding stock and wine. When the risotto is almost al dente, add corn, thyme, and salt + pepper to taste. When done, adjust seasoning, put in a big, beautiful serving bowl, and warn everyone how delicious it will be. If there are non-vegans at the table, top half with grated parmigiano and don’t whisper a word. They’ll never know. I’m not sure why but this morning I woke up with a restless desire to a) buy a tagine and b) make a Moroccan tagine in the tagine. So after work I set out to accomplish both and big success! 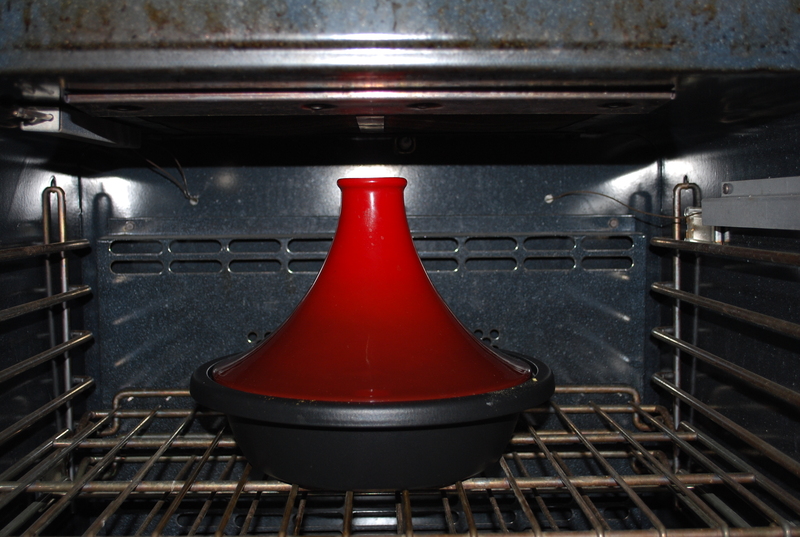 I bought a nice red Le Creuset tagine at a little independent store called The Cook’s Place. I think I’m in love. So what’s different? Why not just use a dutch oven or heavy pot? Well, let me tell you. “The unique shape of the tagine allows air to circulate above the food without escaping. There’s a steam hole to make sure pressure doesn’t grow too much, but it also keeps in most of the moisture. This allows your tagine to slowly steam and roast the food from above, while simultaneously broiling from the heat at the bottom. This combination of cooking-methods allows the food to slow-cook from all directions to make a perfect, fragrant casserole.” This from squidoo. And what did I make in the tagine? 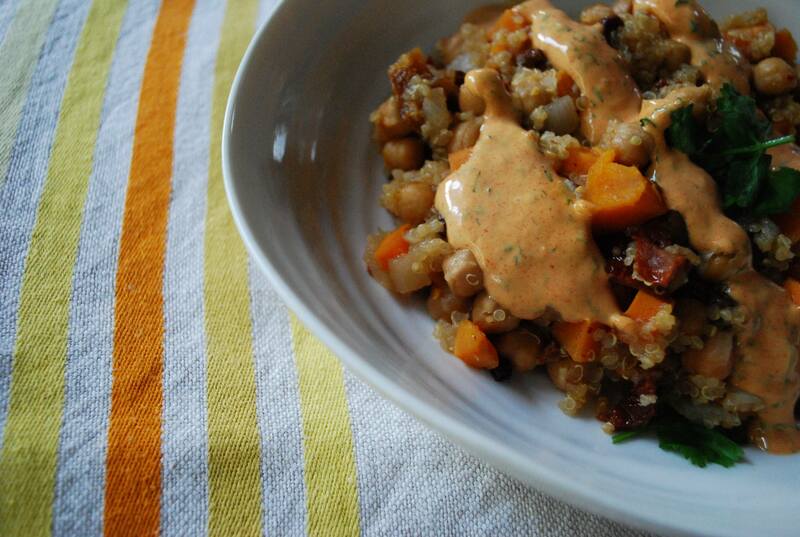 A Moroccan Chickpea Tagine that we drenched in Charmoula, but more on that in a sec. First, here’s the tagine recipe from The Vegan Cook’s Bible. Preheat oven to 350 degrees. 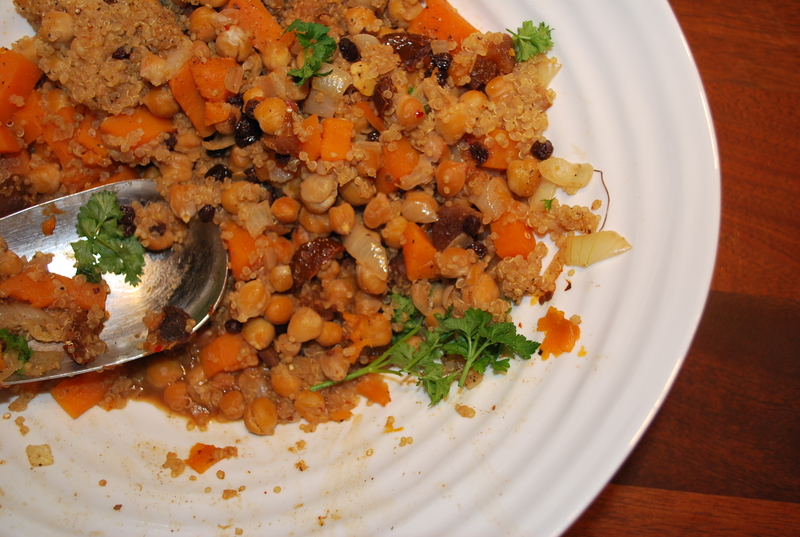 In the base of tagine, combine chickpeas, stock, lemon juice, sweet potatoes, quinoa, onion, apricots, currants, sun-dried tomatoes, ginger, cumin, coriander, cinnamon, and hot pepper flakes. Bake in preheated oven for 1 1/2 hours or until sweet potato is tender when pierced with the tip of a knife. Season to taste with salt and pepper. Serve with Charmoula. It really couldn’t be easier or faster. So what’s charmoula? I asked the same question. I found the recipe in Bonnie Stern’s Friday Night Dinners and, it sounded good, but I had never heard of it. Turns out wiki, of course, has the answer: “Chermoula or charmoula is a marinade used in Algerian, Moroccan and Tunisian cooking. It is usually used to flavor fish or seafood, but it can be used on other meats or vegetables. Chermoula is often made of a mixture of herbs, oil, lemon juice, pickled lemons, garlic, cumin, and salt. It may also include onion, fresh coriander, ground chili peppers, black pepper, or saffron.” Bonnie Stern’s includes mayonnaise, for which I substituted veganaise. Tasty. It actually totally satisfied my longing for aioli which I do love but have put on the no-no list for obvious eggy reasons. 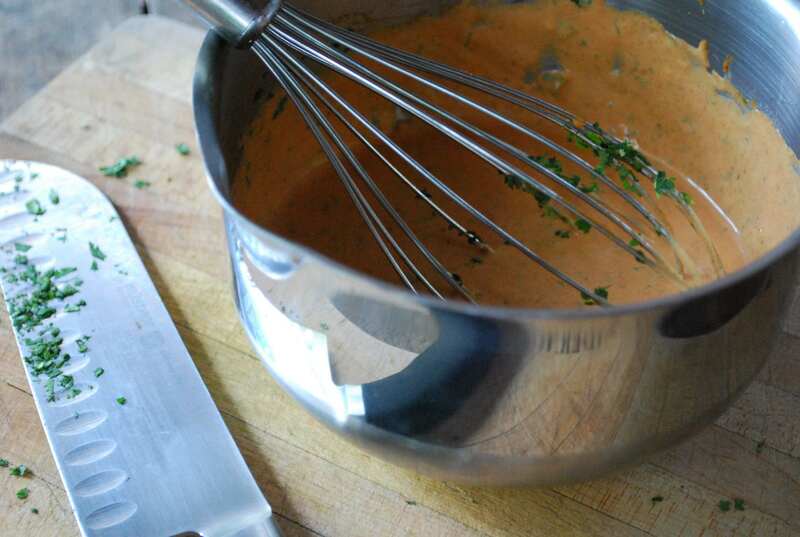 In a bowl, combine veganaise, garlic, lemon juice, hot pepper sauce, cumin, paprika, and cilantro. Taste and adjust seasoning if necessary.